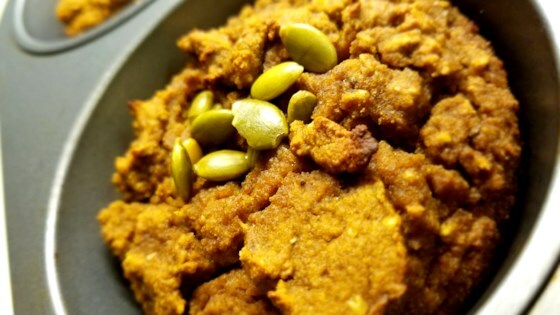 "A healthier alternative to pumpkin bread with the added health benefits of oats, raw honey, and protein." Preheat oven to 375 degrees F (190 degrees C). Grease a 6-cup muffin tin with coconut oil. Place bananas, eggs, honey, pumpkin, oats, coconut flour, protein powder, baking powder, baking soda, cinnamon, and almond milk in a blender in that order. Blend, pausing to scrape down the sides of the blender, until batter is thick and well combined. Spoon batter evenly into the muffin tin. Bake in the preheated oven until tops spring back when lightly pressed, about 30 minutes. Top with pumpkin seeds. Let cool briefly; remove from tin and finish cooling on a rack. Almond flour may be substituted for the coconut flour. You can use any nut milk you prefer.